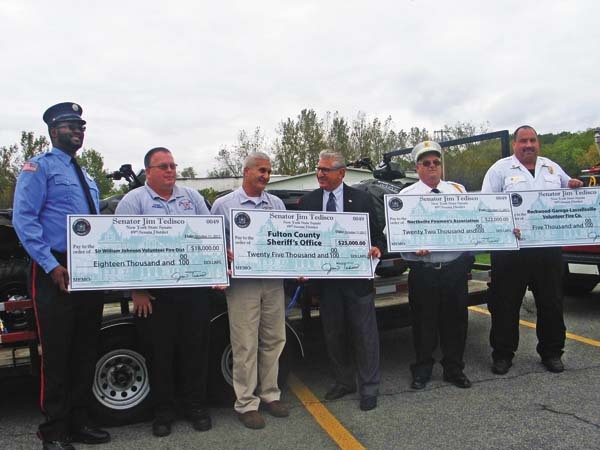 JOHNSTOWN — The Fulton County Sheriff’s Department and three volunteer fire departments were given a total of $70,000 in safety grants on Wednesday. 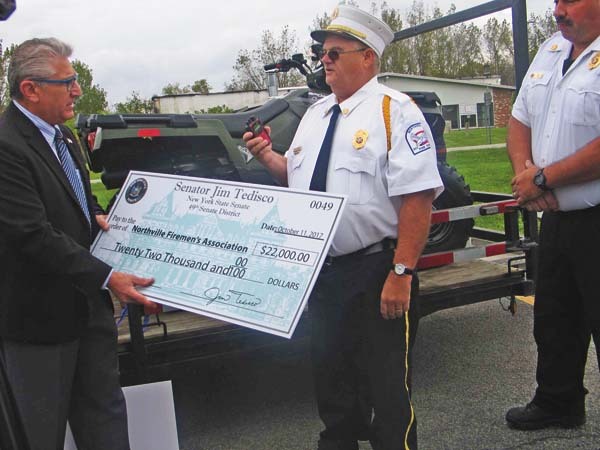 Sen. James Tedisco announced the four new public safety grants the sheriff’s department and the fire companies received. The four departments receiving the grants are Fulton County sheriff’s office, Northville Firemen’s Association, Sir William Johnson Volunteer Fire District and Rockwood-Garago-Lassellsville Volunteer Fire Company. “I’m proud today, to have some grant funding for those first responders who do that difficult and hard work and put their lives on the line every single day,” Tedisco said. Fulton County Sheriff’s Office received a grant of $25,000. The grant will be used for new bullet-proof vests for deputies, to enhance drug investigation efforts and for training to combat the opioid and heroin epidemic. 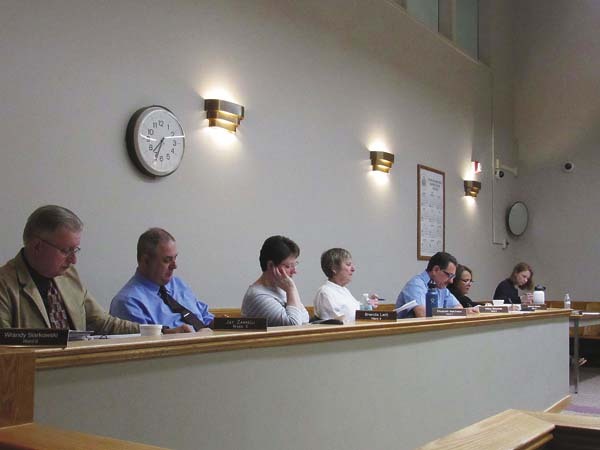 The Northville Firemen’s Association received a grant of $22,000. The grant money will be going toward 10 new pagers and 10 sets of firefighting turnout gear. 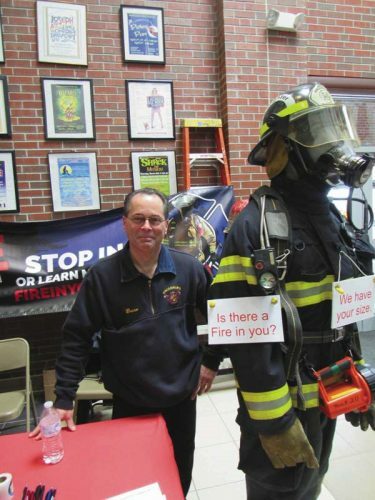 “The gear has to be upgraded every 10 years or so,” said Doug Ellsworth, chief of the Northville Firemen’s Association. Sir William Johnson Volunteer Fire District received a grant of $18,000. The grant money will go toward two ATVs. “We’re also in the process of purchasing a 20-foot enclosed trailer that will be able to hold wildland gear and search and rescue gear,” said Doug Hulbert Jr., chief of Sir William Johnsons Fire District. Rockwood-Garoga-Lassellsville Volunteer Fire Company was given a grant of $5,000. The grant money will go towards the installation of a generator to power its Station 2 during power outages. 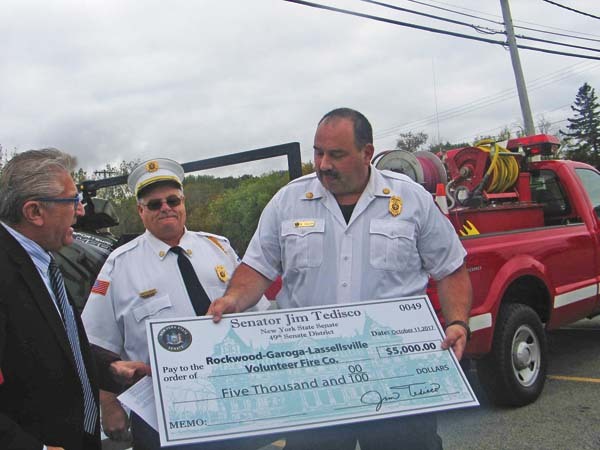 “We have two stations at this time and one station does not have a standalone generator, so this grant will help us install the standalone generator,” said Mark Souza, chief of Rockwood-Garoga-Lassellsville Volunteer Fire Company. Giardino said these grants aren’t four individual grants. The grants are going to be used countywide.